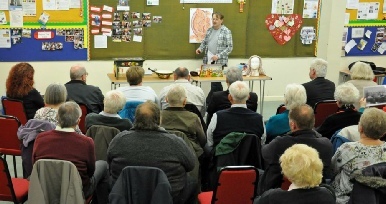 On a miserable night weather-wise, we had a great turn-out of 40 at the Central Methodist Church in Aldergate, Tamworth, for our Canal Heritage Talk. 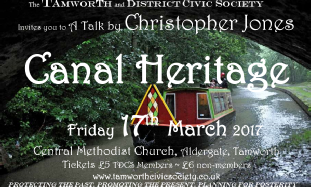 Guest speaker Christopher Jones - a great great grandson of famed canal operator Samuel Barlow - captivated his audience with an inter-active talk on canal life and history, with lots of references to Tamworth. As Chris said, Tamworth should be far more recognised as an important canal centre, with two canals passing though it, and such a rich history of activity revolving around those canals. Chris kept his audience engaged not only with his knowledge and enthusiasm, but by passing round a steady stream of pictures and documents and artefacts for people to look at, identify and question. His most prized item being a family diary of canal activity - which is a most rare item and record of working life on the canals over a century ago. 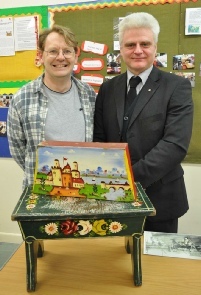 Chris is Chairman of the Friends of Raymond narrow boat charity, and TDCS presented him with a donation for that good cause in appreciation of his talk. 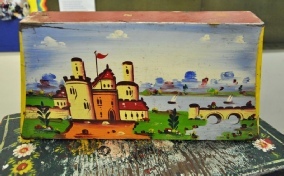 of canal artwork, as shown on this artefact.